It’s been a month now since Skywatcher was released so I guess it’s time I calmed down and stopped looking at what people are saying about both Shatterwing and Skywatcher. It’s time to develop some composure, some sense of being a writer. What does that even mean? It’s also very distracting getting excited, then upset. It could be hormones (they are a bit crazy at the moment) but I’m sure other writers struggle with the same thing. That initial roller coaster ride of being published. Maybe it’s childish to think of my story as my baby. The novel is a form on entertainment. You write for people to read. If they love what you do that’s great. If not it’s tough luck-tough love! Although I appear to be whinging don’t I? I’m not really whinging, I’m struggling to adjust, to reorganise my mindset. I’m so happy with the reception of the Dragonwine series. I love what Momentum Books have done, the covers, the promotion. I am amazed at the thoughtful, respectful reviews, even those that have taken issue with what I’ve done. I am inspired and awed by that. It must be a good thing if people get upset and angry about what happens to the characters or the twist in the plot. I know why things happen and I guess I know how it all ends up, although I’ve not written the ending yet. I’m amazed people around the world are reading Shatterwing and Skywatcher and talking about it in another language, even though they read the book in English. I didn’t expect it to be like this. I didn’t really expect anything. I’m just starting out. I need all the help I can get to get noticed. I’m humbled. I’m grateful and I’m tantalised that people are reading about Salinda, Brill, Danton, Nils, Laidan and Garan and reacting. I have to say a big thank you to those reviewers and readers. THANK YOU! 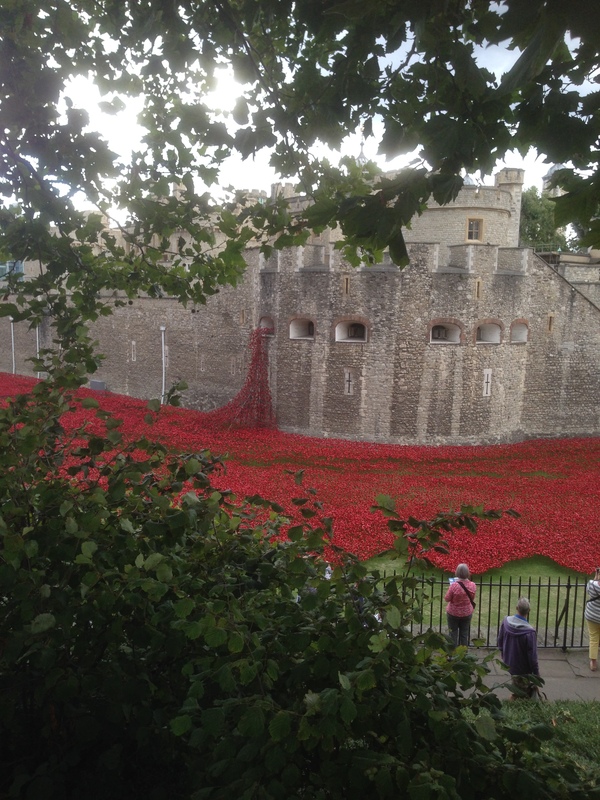 And to give you something to look at, here is the Tower of London and the ww1 remembrance day installation. It was an amazing sight. So many people died. These poppies represent the British soldiers.